5.30 I wake to the sound of birds in trees—a pair of barking owls, the screech of a cockatoo. It’s dark. R is next to me in bed and, on the other side, Lee. It’s the coolest part of the day—just cool enough to have a sheet on top of us. 5.45 I zip open the tent and see the last of the night’s stars. K is sitting in a chair outside the tent reading her kindle by the light of a lantern. She’s six books into the Little House on the Prairie series. “I love the detail, Mom,” she explains and then tells me in Auslan about the Christmas they had after the blizzard of 1876. It all feels such a long way from the Top End in 2016. And yet, there are similarities in the way these characters lived as pioneers 140 years ago and the way we’re living now. K, who identifies with Laura, is completely absorbed in this family of daughters and Ma and Pa, who live on their own in the wilderness in such close quarters, with only each other to rely on. 6.00 I light the mosquito coil and make a cup of tea, then crepe batter. We’ve been on the road nine months now and I feel I’ve reached a sort of Zen state of camping. It feels natural to live like this, directed by the sun and where it is in the sky. I have all that matters to me here in this campsite: my husband and two girls. There’s no rush to get to school, no pressing emails to answer. Life is unhurried, deliberate. 6.15 R wakes and comes outside for a koala cuddle. We identify the birds in the gum tree above—northern lorikeets, different from the lorikeets in Sydney—and mark them in our bird book. I serve crepes with canned peaches (we’re out of fresh fruit). 7.15 I put hats on the girls, who are drawing now. Lee gets up. 8.15 I put sunscreen on everyone. It’s warming up. Temperatures are predicted to reach 38 for four days in a row. 8.30 I take R to the toilet. Just outside the toilet block a snake comes right up to R’s foot. I urge her away quickly and then point out the snake, now slithering towards the wall. It’s the second snake in two days. I saw a large python in the water with me in Edith Falls the day before. 8.45 The girls and I get on our bikes (R is riding her own bike now) and cycle to the hot springs, about 2 k away. Just what you need in 38 degree weather—hot springs! There are a few people drinking VB in the clear warm springs when we arrive. They go and some local boys come by and do backflips into the water, impressing us all. 10.00 We bike back to our campsite in the heat and have a second breakfast. Lee’s done the laundry and put up the canopy. K sews in the shade. R makes a leaf soup. I read my Guardian Weekly from two weeks ago. Lee makes a bacon and egg wrap; R eats half of it. 11.30 I take K to the library in town, which is air-conditioned. We’ve been advised not to do any outdoor activities after 11 a.m. The rest of the day will be spent lazing in the shade, or in the pool, swatting at March flies (a misnomer; it’s September) and then, when the sun starts to set, swatting at mosquitos and squashing sand flies. K will write a short story about two sisters and a bush fire. We’ll read and swim and eat and talk. It’s another good day and I feel lucky to have this year away. Brought on a zen state of reading. 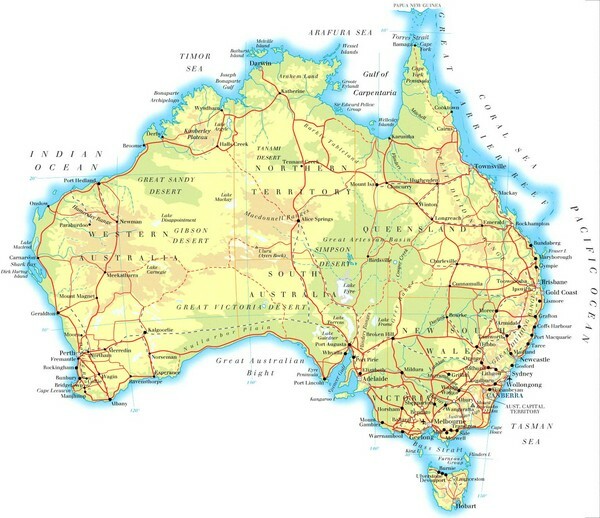 This is a blog about our family (one deaf and three hearing) travelling around Australia for a year with a four wheel-drive camper trailer. We hope to go to some remote areas on this vast continent. We'll also visit deaf schools and deaf communities along the way, including Deaf Games 2016 in Adelaide.